My husband was speaking at a missionary conference. He noticed a young woman who looked decidedly unhappy. 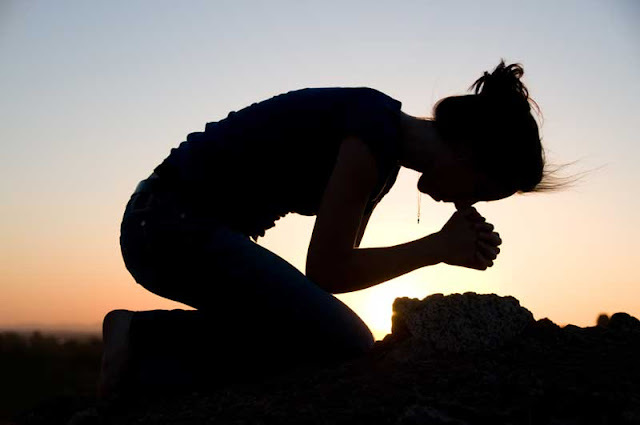 At the end of the service, my husband asked those who wished to, to kneel and pray. The young lady did so. That young lady is kneeling down on the outside, but she’s standing up on the inside, my husband said to himself. He was right. It turned out that she did have serious attitude problems. Among other things, she didn’t want to be on that particular mission field in the first place. Posturing in prayer will show eventually. You just can’t keep up the effort. God of course sees the playacting immediately. Conversely, He notes sincerity of heart and rewards it. Honestly, humility, and helplessness form the basis of effective prayer. God looks at the posture of my soul. If He sees my soul on its knees, He will reward me. A sense of spiritual poverty is what God is after. Jesus said, “Blessed are the poor in spirit” (Matt. 5:3). He did not mean those who are “poor spirited,” but rather the “happy humble,” who make voluntary humility a holy habit. But how do we achieve this voluntary humility? We should dare to ask the Lord to keep us humble! That is a prayer He will always answer. So just what in my life is hindering the refreshing of the Lord? If you are at all sincere and really don’t know, He might tell you if you ask Him. You can pray, “Why have you withheld the rain, Lord?” He might not tell you until you have done some serious soul searching. Look into your past and see if there has been some breakdown in your prayer disciplines. See if there are any broken promises to repent of. Once you realize where you failed, be quick to acknowledge it. It might even be helpful to record your repentance in a book. It’s all about your attitude—remember God looks at the posture of your soul! How can a child of the King have a sour face? Live royally – it’s your birthright.